Henry D. Smith II wrote in a footnote to a scholarly work on the Chūshingura: "The most famous of these servants [i.e. komono 小者], both in fact and legend, was Jinzaburō 甚三郎, the servant-retainer of Chikamatsu Kanroku 近松勘六 (1670-1703) who brought oranges and rice cakes for the rōnin after the attack on Kira." A komono was just one type of servant. The word itself can be translated as a young person; a petty servant; an errand boy of a samurai family; a person of a lowly status; or a menial. "The End" or "taibi" (大尾) from the title does not appear on this print in the Lyon Collection. If it did it would show up in a circle just below and to the left of the publisher's seal. Compare it to the first link above to the Museum of Fine Arts in Boston with a copy of this print with the 大尾 seal. The second link, which we have added to another copy in their collection is like the one shown here - without the "taibi" imprint. There is a commercial web site that calls itself the "Postcard Museum" (絵葉書資料館). A fascinating site worth visiting. 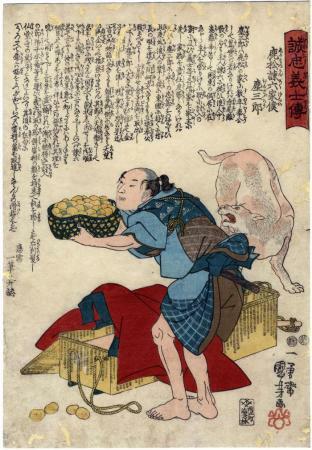 One of the postcards they are offering is an old, non-colored reproduction of the print shown on this page, but with an awkwardly translated title in English at the bottom: "JinZaburo, the Vassal of Kanroku, Chikamats." No date is given but it looks to be from the late 19th to early years of the 20th century. Illustrated in Kuniyoshi: The Faithful Samurai by David R. Weinberg, 2000, #I.51.